Photo-sharing app Instagram is now looking to add more features to its Web portals, to make it more functional there. To this effect, Instagram has upgraded its mobile website to introduce the ability of photo-sharing. 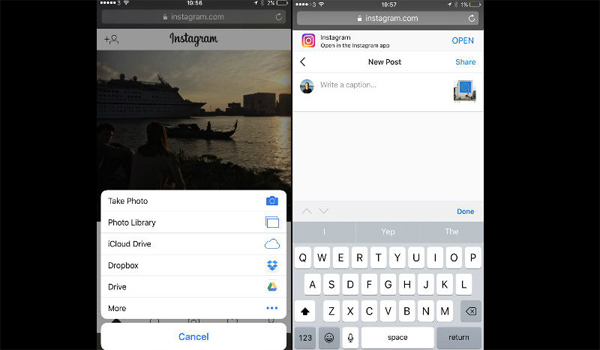 Alongside photo-sharing, a condensed version of the Explore tab is also added. The ability to share photos on the mobile website is still limited, with the option only allowing to upload photos and crop them to a desired shape if the need be. It still doesn't allow you to upload video, edit photo, or even apply filters. However, you can edit your profile, or create a profile for that matter from the mobile web version. This upgraded mobile website version was first spotted by Matt Navarra. Instagram later confirmed it to TechCrunch, "Instagram.com (accessed from mobile) is a Web experience optimised for mobile phones. It's designed to help people have a fuller experience on Instagram no matter what device or network they are on." The mobile website now looks a lot like the app itself with a light version of the Explore tab as well. The mobile version lets you see posts, notifications, your profile, and even like photos of others. It even lets you comment on them if the need be. The adding photo feature is not visible to everyone as of yet, so maybe it's a gradual roll out that should arrive in the coming days. Facebook's Instagram recently also announced that it now has 700 million users. The company adds that the last 100 million users were added in just four months.